Draw your own conclusionsPerhaps the main point to make at the outset is that this book is not a documentary-style report of Flight 401 and surrounding paranormal phenomena, but rather an autobiographical account of the author’s personal journey of investigating these events. As such, the reader is first introduced to the author’s life at the time he first heard about the paranormal events, namely from a stewardess on an international flight, and his subsequent curiosity as well as doubts. This is not an entertaining ghost story, nor was it meant to be, and it is, in fact, an all-round challenging subject. In describing his own initial scepticism and disbelief, the author shows the normal thought processes of most people when confronted with the paranormal. Questions such as: ‘is this a credible witness?’ and ‘if it’s true, then does it mean there is life after death?’ How does this new knowledge harmonise with my belief system thus far? If a person is religious, then how does the paranormal fit into one’s view of the world? All these questions and more are weighed and thrown about throughout the book as the author slowly plods his way through the research process. After an initial introduction to the author’s work and experience with unusual, controversial subjects thus far, the book describes the crash of flight 401 at considerable length. The author re-enacts the conversations in the cockpit prior to the crash, taken from the cockpit voice recorder which was available to him from the FAA. Some readers might find this section boring if not interested in planes and cockpit procedures, especially since there is nothing unusual or paranormal about the crash itself.The process of finding the witnesses who claim to have seen apparitions on similar planes after the crash was not easy for the author since most members of the flight crews were afraid to speak of their experiences, lest they were sent to a psychiatrist and risked losing their job. Nevertheless, the author succeeded in speaking to several key witnesses, and he describes his impression of these individuals, namely intelligent, well-balanced, technically-minded professionals (ie, not the ‘kooks’ one would generally expect to have seen ghosts) As his investigations continue, he ends up using an Ouija board to attempt communication with one of the pilots who was seen most often in planes of the same airline as the crashed plane. The communication he receives becomes quite astonishing, and appears to be the final definite proof he was searching for, but the reader is still hearing things second-hand and thereby left with questions. Whatever each individual reader takes away from this book, the facts are that even though Eastern Airlines never made an official statement acknowledging the many sightings and experiences of its crew, the management must have taken it seriously because they authorized the removal of cannibalised parts from the planes which experienced the paranormal phenomena. It was generally believed that the apparitions were connected to the parts taken from the crashed plane, since the phenomena occurred only in the sister planes that received these parts – such as food-heating ovens in the lower deck galleys where one of the pilots was most frequently seen. This fact was mentioned briefly in the book, but the author’s experience with mediums and the Ouija board give a different outcome and reason for the cessation of apparitions and paranormal phenomena on the planes. Every reader can draw their own conclusions after reading all the available material in this book. I have to admit I was a little disappointed with this book. I was already pretty familiar with the details of the crash of Flight 401 and the stories of ghostly manifestations of the crew in jets using equipment salvaged from the crashed plane, and John G. Fuller didn't give me a lot of additional information in this book. Obviously, someone with less knowledge of the subject matter should find the book more fascinating than I did, but I also think the book suffers from the method of presentation Fuller chose to use. I would say that The Ghost of Flight 401 is more about Fuller's experience writing the book than it is about the subject matter in and of itself. In no doubt due partly to the era in which he wrote (ghost stories received much more ridicule in 1976 than they do today), he seems too preoccupied with his credibility. Early on, as he discusses the way in which this book came about, he refers repeatedly to his previous books on such serious matters as nuclear power. Then, toward the end, he takes us on a quick jaunt through some of the more serious and credible scientific theories regarding the possibility of life after death - just before closing the book with what he knows to be the most questionable part of the whole story.Fuller never really presents the reported ghost stories in any kind of delineated order, merely mentioning them here and there along the way - sandwiched between his own internal debates over the validity of the information and his own ability to believe it. He doesn't let the facts speak for themselves, and that tended to make this a frustrating read for me. At times, I found myself saying OK already - can we get back to the actual story now? I certainly understand his desire to not be labeled some kind of kook, but his preoccupation with his role in the telling of this story does little to help his credibility. The words "Methinks he doth protest too much" cannot help but come to mind.Fuller's detailed description of the crash of Flight 401 into the Everglades on December 29, 1972 is informative and well-written. His discussion of the difficulty in getting witnesses of the later ghostly manifestations is also timely and germane. Some of the accounts he did manage to get are provocative and significant if true - and therein lies the rub. A lot of the stories Fuller tells us are of the hearsay variety, acquired via third (or more) parties. Obviously knowing that he could offer up no authoritative proof for life after death (which was essentially the overall goal he pursued), I think Fuller struggled with the whole writing process, particularly in terms of how to end the book. That leads him - albeit reluctantly - to ultimately journey outside of his own self-contained box of credibility into the realm of spiritualism. His claims of having communicated with the spirit of Flight 401 flight engineer Don Repo leave him wide open for the skeptical criticism he feared so much. That is not to say it isn't true - and he offers reasons as to why he believes the communication was authentic - but it probably takes this good ghost story a little farther than many readers will be willing to go. 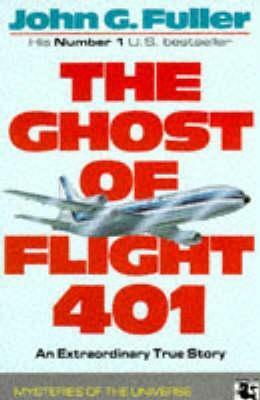 I don't know if the definitive account of the ghosts of Flight 401 has been written yet - I just know this isn't it. Published in 1976, this is a fascinating account of the crash and aftermath of Eastern Flight 401 in the Everglades back in 1972. A little over 100 people died in the crash. 77 people managed to survive. Viable equipment salvaged from the crash was later put into some other Lockheed 1011 Tristar jets. On various flights of planes with salvaged equipment, both passengers and crew started seeing the ghosts/apparitions of two of the dead crew members (Bob Loft and Don Repo) from Flight 401. The first third of the book deals with the crash of the plane and rescue efforts. The rest of the book deals with the reported paranormal experiences and the occult. The ghosts/apparitions eventually stopped. The cessation of appearances, especially of Don Repo, appear to be connected to a séance and an exorcism conducted by airline employees. I straight up loved this book. I have always been interested in ghosts, and ghost stories, most books you read are either very old stories, or too short to immerse yourself in. I am sold on the existence of ghosts, always have been, but what I loved the most about this book was the fact the author A) was a skeptic himself and B) he made it a point of the book to really track those leads and gather enough information to convince even himself. I also love that by the end he feels he has gathered enough information for himself to open to the idea of life after death, but you can tell through his writing, getting that far surprises even himself.The book is great from the off, the build up to the flight, the vivid reality of the crash which in all honesty makes you feel a little melancholy for a while, and then the story that emerges after, concluding with a lighter mood created by getting to know one of the flight crew a little more personally.I will definitely read this book again, and am very glad I got to read a more modern ghost story, it may be 40 years old now, but it certainly still resonants with a modern world. There were a few things that I really liked about this book but there was also multiple things that I really didn't like. I loved how the author explained about the different ghost stories and the whole sequence of the book that talked about the plane crashing. I was on the edge of my seat through several of these scenes.However, I got so confused as Fuller jumped from character to character during the plane crash and then while he was talking about all the people that he got his research from. He was constantly mentioning awards that he got on other books and that he was in Florida studying for a more important book on oceanography. Like who cares? It's completely off topic. I just found his arrogance dripping from the pages and words of this book and it annoyed me so much. I would definitely not recommend or read this book again. The account of an airplane crash in the everglades in the 70's and the bizarre occurrences on it's sister planes. The account of the crash and the survival of the passengers and crew is harrowing, the next section doesn't quite live up to the hype. Congratulations to John Fuller for making an account featuring many people and many, many important details into an engrossing story. (The writer of "102 Minutes" could learn a lot from him!) The book begins with the fateful Eastern Airlines flight 401 and the series of tiny, by themselves insignificant, details which led to its horrific crash in the Everglades. There is a harrowing account of the drawn-out and difficult rescue. Then it skips forward several months to the strange reports of dead flight crew members appearing on other Eastern flights. They are seen by many witnesses - crew and passengers - often by numerous witnesses at the same time, leading to flight delays and cancellations and even police searches of the planes. Details were entered into the flight log book, but when other flight crew came to examine the logs... The relevant pages had been removed by Eastern Airlines. What sets this work apart is John Fuller's obvious desire for journalistic and scientific rigour. He is sceptical almost throughout the book, sometimes getting closer to believing, but mostly keeping an objective distance. Until the end. I won't reveal that, obviously, but I had tears in my eyes, which I never expected from a book like this. Definitely worth a read for those in two minds about the supernatural. The evidence presented here is as close to irrefutable as I've ever seen. I wanted to like this book. I sometimes like ghost stories especially when they are good ghosts. I had heard about this ghost years ago and even watched a movie about the crash so when I saw this book I really wanted to read it. It was an okay read but also sad. It also reminded me of another Everglades crash ValuJet in 1996. I have no opinion about the ghost of Don Repo or Captain Bob Loft or the rest of the flight crew but it is strange. The author seemed to go off on the paranormal and even communicating with the dead via Ouija boards which I did not care for. The actual crash and appearances or apparitions were of interest to me. I also think the plane crash had more to do with the plane than the pilots which is sad. It wasn't pilot error. It was to easy to screw up and that was the fault of the manufacturer not the pilots. I've read this book twice and its still creepy. VERY good ghost story. Ok. Much skimmed. More document than tale. Another DNF. This one was just to depressing to read. Every time I start to read it I think about all those people that died in that plane and it just depresses the hell out of me. Its just so sad. I wanted to like this. I was fairly certain it would be bunkum, but at least it would be entertaining bunkum. It started out so promisingly, with a clear reconstruction of the fatal crash and its immediate aftermath and explanations of the various supernatural phenomena germane to the mystery. Fuller elucidates the sequence of appearances and other unexplained events and interviews eyewitnesses and quotes numerous outside sources, lending a patina of objectivity and scientific methodology.Unfortunately, the last forty pages descend into bathos as the author and his assistant contact the wife and daughter of one of the dead pilots and conduct a Ouija session wherein the dearly-departed husband and father declares his undying love and plucks at the heartstrings of everyone present. The contact reaffirms the bonds of love and both the tenacity and fragility of life and exalts the wonder and mystery of the world, and whoop de doo. It's an uneven, muddled read, and while it might serve as a not-unpleasant means by which to pass the time, don't expect to learn anything conclusive or even likely. It's a decent ghost story, but if you are interested in the possibility of life after death, there are better books out there. I have to agree with other reviews on here. This book could have been a really interesting study of ghost stories in the modern age, but Fuller spends so much time trying to convince us that he's not crazy that the original point gets lost. I had really high hopes, because the description of the plane crash was amazing--my heart was pounding and I was really nervous! It felt like you were there, honestly. If Fuller could have put that eye for detail towards his paranormal research, instead of hemming and hawing about how craaaaaazzzzyyy it all sounded, this would have been an amazing work. Instead it's just ok.
Pfft. Mawkish to the extreme. It does an Oprah version of vantage point describing the eponymous plane crash from about 10,000 different points of view, only in the mushiest way possible.And how can you take any book that uses Uri Geller as proof of the supernatural seriously? OK, I know lots of people still believed good old Neo.. er.. Uri was a genuine psychokinetic back when this book was written, but that just show how poorly this book has aged. There may have been something to this tale, but Fuller does nothing to keep a 'rationalist' (ooh, sounds sophisticated eh?) interested until it's revealed. I enjoyed all the part about the crash and how it happened and the survivors stories etc. I enjoyed all the the stories of how, where, when and who of the ghosts showing up and those parts... But all the psychic talk, the "is the mind separate from the consciousness separate from the brain." Weight of dreams, psychological world from physical world, is after-death personality completely immaterial..blah blah blah blah zzzzzzzzzzzzz.. If you're into that stuff this is the book for you. Tons of it!! It's not what I was looking for. I'm sure this was an amazing book 40 years ago and I'd love to read an updated book on the story but this was a snoozer for me for the most part! Amazing, well-written book. I was a skeptic about life after death, now, not so much. I kept looking for the author to blindly accept what he was uncovering in his research, but he never did. Best book I have read regarding the possibility of life after death, ghosts, communications with the deceased, and so on. As Shakespeare wrote in Hamlet, "There are more things in heaven and earth, Horatio, than are dreamt of in your philosophy." Mankind once worshipped the moon as a god, and we know better now. Maybe we need to investigate this unknown frontier with more diligence. I give the book top marks not because it was especially well written, or because it was particularly well outlined, but because the topic was so interesting. I'm not one to take much stock in ghost stories, nor was Fuller at first, but the evidence that he turned up makes one think. PS. Perhaps I have a more vested interest in this book than most because I once camped for a few days near the crash site on the Everglades. I could have witnessed the disaster first hand, had I been there a couple of years earlier. This is a GREAT ghost story, and well worth the read. Fuller has a direct, no-nonsense approach that makes for a compelling nonfiction read. He spent a little too much time exploring 'scientific' theories of the ghost phenomenon. I also was not interested in his embrace of (or lengthy justifications for) psychic mediums. The first two thirds of the book are fascinating, however. The last bit where Fuller and his future wife reluctantly turn to the Ouija board for answers tests the bs meter, but is interesting nonetheless. I got interested in this book after watching the corresponding episode on the Aircraft Investigation series. Overall, the book is a good account of the author's research into the subject of ghosts and apparitions. But, even after reading the book, I had many unanswered questions. One of the reasons could be that the subject is very vague. It made me doubt at many places if the account is genuine or no. Most of the facts that have been presented are second-hand reporting of the crew and passengers.Neither happy nor disappointed at the work. Read only if interested. I find ghosts fascinating but this book is more of a book that tells a story while the author proves that they are not crazy and the incidents happened. I skipped a lot of the authors writings about their own projects and other writings. If you're looking for a book that is trying to prove the stories are real, then read on, if you're looking for a good ghost story and don't need every page to be proof of the validity, then skip this one. I can't recall why I bought this book - I think I saw it recommended somewhere & read the first chapter, which intrigued me, so I bought it.It's a very 70s book - non-fiction, and focussing on the odd stories about a plane crash, and the ghosts that flight crew claim to have seen afterward. I am not sure I buy the idea of ghosts, but it's a cracking read, all the same. Not what I signed up for. First half was an engaging depiction of the plane crash and ensuing apparitions.But then it descended into psychic mumbo-jumbo. Fuller gives an unabashedly favorable retelling of his psychic encounters and then attempts to regain some sense of balance by saying he's still skeptical. Yeah, sure.Do yourself a favor and skip the last half of the book. I found the book very interesting but couldn't help comparing it to Fuller's other work. I guess back when it was written it was easier to believe (or try to) in the supernatural, but that was an issue for me. He is very good at presenting the info. Very interesting and entertaining book if you like ghost stories. It certainly leaves you wondering if there could be any truth to the ghostly aspects of it. The crash scenes are excellent and keep you on the edge of your seat. Tries a little too hard to convince you of his credentials and validity. Otherwise it was very interesting. His description of the crash made you feel as if he went through it. And his account of the contacts and seance was cool. Though the jacket really should have warned me, this was really more a foray into the possibility of life in some form after death as opposed to the aviation aspect. The opening on the accident was well told, and the ending draws you in as well, but most of the middle just didn't hold me. I had never heard of this plane crash until reading this book. I thought this was a book of fiction, I was surprised to find it a true story. I do wish there was more about the plane and people and less about him. Books Related with The Ghost of Flight 401 by John Grant Fuller Jr.